Previously we've discussed how to copy or move the images that you take with an Android phone or a tablet to your main photo collection on the PC. In this second part of the article, we will discuss the transfer of the photos in the opposite direction, from the PC to an Android device. Why to transfer the photos from a PC to a tablet, you might be wondering? Because the tablet is a very good device to showcase the photos! If you take photos with a digital camera and store the photo images on your PC, you would probably want to transfer them to the tablet, and organize them in albums, to make navigating and displaying them to your friends a breeze. You can safely reduce the resolution of the images for viewing them on the tablet, and you wouldn't notice any difference in their appearance. Another reason to reduce the resolution of the images before transferring them to a phone or a tablet is to save the storage space of your device. The storage capacity of your phone or a tablet is probably not too large, somewhere between 16GB and 64GB for a typical device in use these days. Considering that a large part of the storage is probably used by the apps, maps, music, and other files that you have there, you probably don't have much storage to devote to the photos, right? Let's do some number crunching: how many full-resolution images can you put within a 1GB of storage space on the device? If an average size of a full-resolution image file is 10MB, and taking into account that 1GB is 1024MB, dividing 1GB by 10MB we get the answer: about a hundred files. If you use your digital camera often, your photo collection is probably much larger than that. That why you want to reduce the image resolution before transferring them to the device: it would let you put many more images onto your tablet or a phone. Before using this command, you may want to set up a "staging" folder for the images you want to be transferred to the tablet or a phone. Why would you need it? 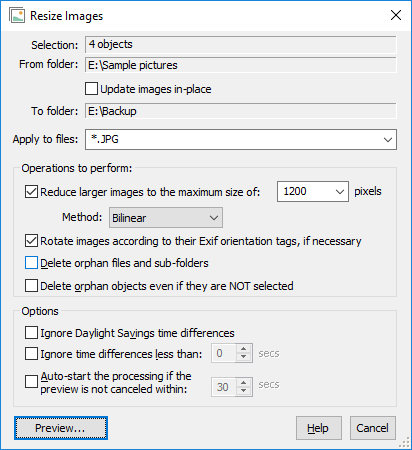 Because you are going to reduce the resolution of the images before transferring then to the device (see above that's a good idea), but you want to keep the full-size originals, too, that's why you need a separate folder for the reduced-resolution images before you transfer them to the device. Also, you probably don't want all of the images to appear on the device, you want only the best ones to go there. And you probably want to create a few separate albums on the device, to keep images that belong to different topics separately, nicely organized. Where should you create the staging folder? Almost anywhere. (As long you can remember where it is later on.) For example, create a Temp folder on the C: drive, and then create a subfolder there, naming it, for example, Photos for the tablet. 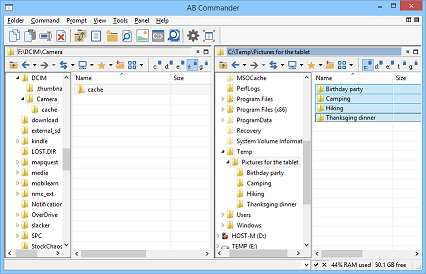 Of course, you can use AB Commander to navigate to the folder and use its New Folder command on the Tools menu for that. Next step is to create a few more subfolders in the staging folder: each such subfolder will become an album when you transfer it to the Android device. Navigate to each subfolder in turn, and then copy the photos from the folder where you keep the master photo collection to the staging subfolders. Use the Quick Viewer of AB Commander to quickly preview the images while you are deciding which ones are good enough for the tablet. CAUTION: Keep in mind that if you use the mouse to drag and drop the files, and the staging folder is located on the same hard drive as the master folder where you keep the originals, then dragging the files with the mouse causes them to be moved rather than copied! Since you want to copy (rather than move the files), keep the Ctrl key depressed while dragging the files with the mouse, to enable the copy mode. The staging folder for the images to be transferred to the device. That's it for the initial transfer of the images. What if you want to add some more images later on? 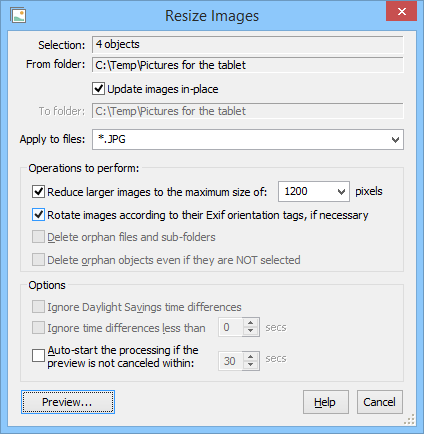 Copy them into the staging folder, and run the Resize Images command in place again. 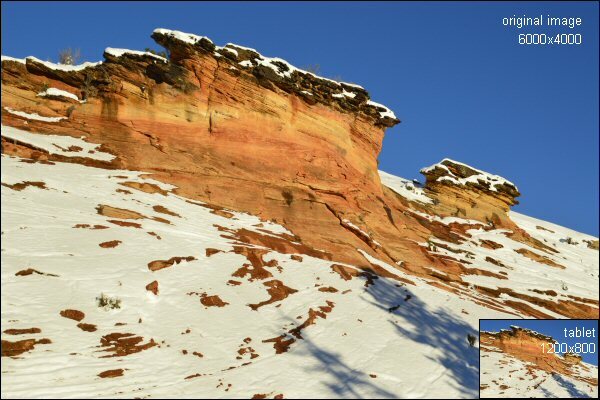 It will skip the images it had previously resized, and only process the new images. When done, copy the images from the staging folder onto the Android device again. That's how it works for the Android devices, but what about the iPads, iPhones, or the Windows 8 devices, you might ask? Not much different! The procedure for the Windows 8 devices is basically the same, but in case of an iPad or an iPhone you need to use iTunes to synchronize your staging folder with the device. The preparation of the staging folder and resizing the images remains the same.